A gated community dock near Nuevo Arenal. A property slightly west of Nuevo Arenal. 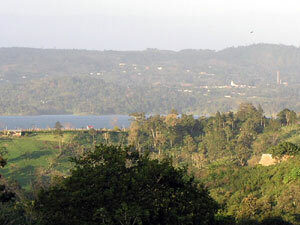 Nuevo or "New" Arenal sits on a promontory high above the lake, which claimed the original village decades ago. It's the principal community on the north side of the lake, where there are more fine homes, more restaurants, fewer villages, and a bigger Gringo population as compared to the south side, though the bigger Tilaran on the south side is the municipal center. Nuevo Arenal is only 30 minutes from the dam at the eastern end of the lake and thus about 45 minutes from the volcano tourism center, La Fortuna. It takes about 30 to 35 minutes to go around the western end of the lake to Tilaran, through which one passes on the way to the international airport at Liberia or beyond to the Pacific beaches. Near Nuevo Arenal are many rather imposing volcano-view homes, lots in or out of gated communities, acreages large and small, even condos. Nuevo Arenal has a boat launch area, which is a popular spot to gather. 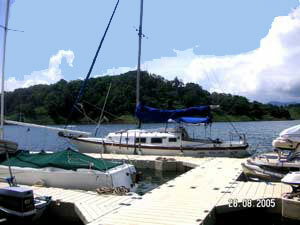 There are several floating docks on the north side not far from Nuevo Arenal. The area gets more rainfall though less of the seasonal winds than the south side of the lake. .
B39 Nuevo Arenal's only gas station. Busy. Much cash flow. $1,300,000 negotable. 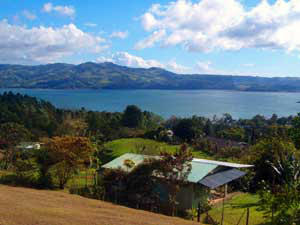 H49 4BR 1BA Tico home with fine views of lake and Nuevo Arenal - $502,000 negotiable. B13 Two-story business building on busy highway. $85,000. Owner financing possible. A33 55 lakeview acres with nice 2BR 2BA home. Great for development - $995,000. H28 2 BR 2BA furnished lakeview home in gated community, $179,000. 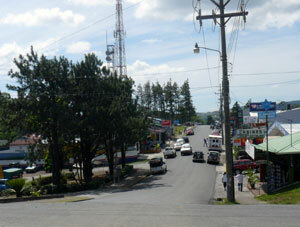 A3 10 volcano and lake view acres with nice building sites north of Nuevo Arenal - $481,000. 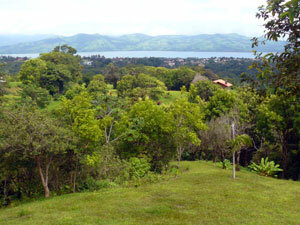 A5 46 acres above Nuevo Arenal - $400,000, just $2.14 per square meter! Nuevo Arenal from the southern side. The view from a home near Nuevo Arenal. The main street/lake highway intersection. The town sits partly on a ridge above the lake.